DN1050 highways agency catchpit Highways Agency Compliant EPDM flexible seal DN1050 CatchPit Precast concrete catchpits with the new flexible rubber pipe connector seals can be utilised every 100 metres on a single lane carriageway, replacing the requirement to cast a base sump in situ and construct the catchpit from a standard DN1050 manhole ring. The innovative EPDM 40 flexible rubber seal at the connection points can accommodate pipe sizes DN150 to DN 300, including DN225. This negates the need to saw cut openings in the concrete wall and the use of wet mortar trades to seal the pipe surround. Catchpits are supplied with factory fitted pre-marked EPDM 40 rubber blanks. The unique rubber blank/ seal has pre-formed cutting grooves around the three DN entry sizes indicated. This allows for accurate cutting out to pipe diameter requirement. There is no similar system available in the market. Once pipes are fitted into the seal, up to 45 degrees of pipe deflection is permitted without breaking the seal. The significant savings are in time, eliminating the need for follow-up finishing gangs. Added safety benefits are keeping operative time in the excavation to a minimum and no power tools are required to cut concrete. Indirect cost benefits are as a result of saving up to 26 hours of time related to curing of wet trades on a traditional build. Requirements for catch pits are as specified in the MCHW 500 Series Clauses and MCHW 3: F Series Drawings. The MCHW clauses call for the catch pit to be in compliance with BS EN 1917 and BS5911. 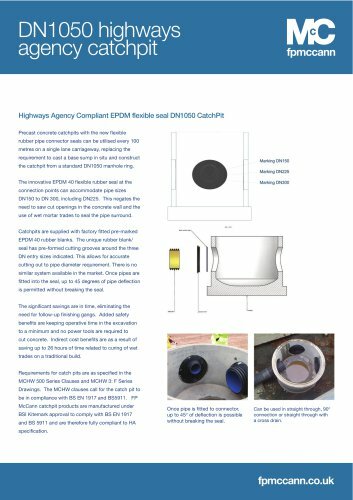 FP McCann catchpit products are manufactured under BSI Kitemark approval to comply with BS EN 1917 and BS 5911 and are therefore fully compliant to HA Once pipe is fitted to connector, up to 45° of deflection is possible without breaking the seal. Can be used in straight through, 90° connection or straight through with a cross drain.